The SA National War College’s annual combined joint African exercise (CJAX) is currently underway with three participating and three observer countries taking part. Apart from South Africa as the host country, Botswana and Zambia are taking part in the classroom-based exercise which has become a yearly feature of the training calendar at the Pretoria higher military education institution. To five the exercise more value the war colleges of participating countries have exchanged students for the five day exercise. Observers for this year’s exercise which ends on Friday, July 15, are from Malawi, Uganda and Zimbabwe. 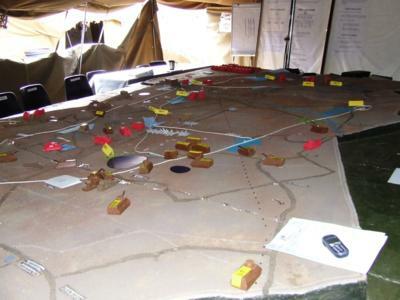 CJAX is designed to equip senior military personnel on the Joint Senior Command and Staff programme with the knowledge and capability to plan or command a peace support operation (PSO) in a multi-national environment. This year is the fourth time the War College has hosted the CJAX. The exercise is based in the fictitious state of Carana, part of an island off the east coast of Africa. Carana is a failing state and the UN is contemplating sending a mission. In the interim the African Union (AU) is asked to provide assistance. Learners then roleplay an African Union (AU) Integrated Mission Planning Team to write a mission plan for the speedy deployment of an African Mission using joint international and multi-national planning processes as well as doctrine from the regional African Standby Force (ASF) and Southern African Development Community. The final phase of the CJAX takes place via video conferencing between the three participating countries.